This is the grand post on converting the rear shocks of an MGB to the rear shocks of an '84-88 Dodge Colt. This was originally sent to me by Dave Tietz, who used to be on the MGs list, but I haven't seen him here for a while. So, credit goes to Dave in his absence for laboriously researching this and being the lab rat. I can say that I have performed this conversion and it's one of the best things I have ever done to my MG. Thanks Dave! For the record, I used Sears Road Handler Performance Gas shocks which are really Gabriel VST shocks. These are on the stiff side and would be great for performance applications. They are still nowhere near as stiff as the Moss conversions! Those seeking a smoother ride may consider the Monroe SensaTrac or other shock. The car is a 1967 MGB-GT with new springs and all new mounting hardware and bushings. YMMV. MGB Rear Tube Shock Conversion. Note the flipped spring bracket. Updated Jan 1, 1998 by Skye Nott based on comments by Lawrie Alexander, Rick Morrison, Jim Stuart, and Andy Ramm. This worked for me, on my MGB-GT, and appears to be working well after 6 weeks. This is for your information only, and you are warned that if you attempt this conversion, you do so entirely at your own risk. Sorry, but in this litigious age, I want it understood, I ain't responsible for nothing. I wanted to "modernize" my MGB-GT's suspension with gas filled tube shocks, and after doing some shopping, decided on the Moss-Monroe front and rear kits. After installing both sets, I discovered that the rear shocks were way too hard (the shocks are from GM 1/2 to 3/4 ton vans, front suspension). The front shocks seem OK.
After a frustrating 6 weeks talking to Moss Technical, I was able to return the shocks to the dealer. Moss was nice enough, but I don't think they really understood the severity of the resulting ride, or they didn't get enough complaints on the product (although I know of several besides me). I kept hearing "Its a competition product", or "The stiffness makes for better handling", neither of which I can accept. I have ridden in several Porsches and Corvettes, none of which was as teeth jarring as my shocks. I did some research on my own (shock absorber books are a closely guarded secret with most dealers and parts houses for some reason). One friendly dealer, a local Tire Kingdom, let me spend about 3 hours with their book, and I was able to find shocks that have an acceptable compressed dimension, a longer extended dimension, suitable mounting bushings and are designed for a similar weight vehicle. The conversion does not require modification to the car (other than relocating two parts) and uses existing mounting holes. To be safe, I measured the distance of the Bump Plate (on top of the axle, and the Bump Rubber, and found it to be 4.1 inches (I have new rear springs). I then measured the distance from where the bottom of the shock mounts (the hole that was moved from up to down, in step 2 below), to full compression of the shock, and found that to be 4 inches. As the shock is mounted at an angle (and will not compress inch for inch to the vertical distance between the Bump Rubber and the Bump Plate) the shocks cannot bottom out. It would be good to double check your vehicle. (2) 2-1/4" long, 1/2" fine thread Grade 8 bolts. (2) 5-1/2" (6" will work) long, 7/16" fine thread Grade 8 bolts. (4) 7/16" lock washers or use locking nuts below. (4) 7/16" Grade 8 nuts (or locking nuts). (2) Monroe Sensi-Trac 5877ST Shock Absorbers or equivalent. The Monroe Sensi-Trac 5877ST are from the rear of a 1984-1988 Dodge Colt and may be used on other cars. NOT the shocks for the Colt Vista Wagon - they may be different, but that hasn't been confirmed. The Monroe 5877ST is fairly pricey at about US $38 apiece. The Gabriel Pro-Rider Heavy Duty Gas Shock P/N 73636 has also been used and reportedly is working well. They can be had for as little as US $13 from places like Pep Boys. The holes for the original shock absorber are 7/16" and the holes in the spring plates are a snug fit on a 1/2" bolt. To fit to the lower shock mount, the tube in the shock mount will need to be reamed to 1/2". Easily done with a 1/2" bit, and a variable speed drill motor running at slow speed. Using the 1/2" in the lower mount virtually stops any movement and subsequent "wallowing out" of the spring plate hole. By modifying the shock instead of the holes, the procedure can be reversed if you want to return to the original parts. The old lever-action rear shocks (1) and links (2) are removed. The shock brackets (21) are removed, flipped over (so the hole points down) and replaced on the other side (left one on right side, right one on left side) so the hole is still on the inside, but the bend is down, instead of up. This is a perfect time to install new spring-to-axle pads (20) as well, as these are almost always worn out. Re-torque the four U-bolt (14) nuts securely. With the 5-1/2" bolts, bolt the top of each shock in the forward-most old shock mounting hole. Use the fender washers on either side of the "frame", bolt head in the wheel well. The shock bushing, a flat washer, lock washer and nut on the inside of the frame. With the 2-1/4" bolts, bolt the bottom shock mount through the hole (if it is "wallowed out", from years of movement by the old shock, you can drill a new mounting hole to the rear of the original hole which gives even more clearance to bottoming-out). The new hole should be a clearance hole for the 1/2" bolt, like 17/32". Use washers on either side of the shock bushing, and lock washers/nuts or locking nuts. Torque the bolts securely, I am a fan of Lock-Tite, and used it lavishly, both in re-bolting the U-Bolts and shock mounting bolts. 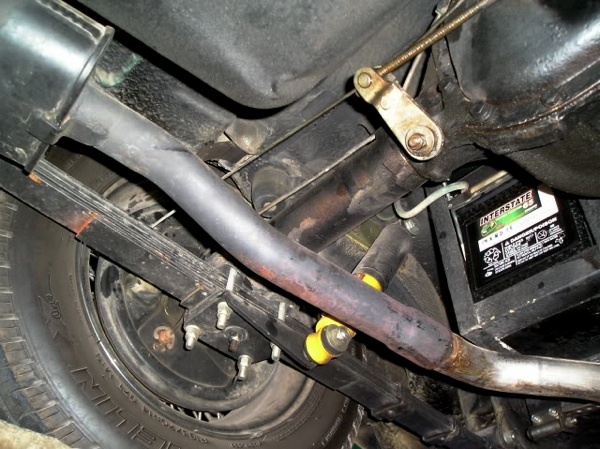 Make sure no other components are near the shocks, like a previous owner, re-routing the fuel line, or wires or anything that might cause wear or failure of a part. On my car, they were clear all the way around. As noted above, this is about a US $80 conversion, and I believe the Sensi-Trac to be superior to the 1920's technology Lever Action shocks (and more closely matched to the MGB than the Moss kit). The conversion has now been on the car for 8 months, and seems to be working beautiful. This car is my daily driver, and we are at about 7,000 miles. On the road, the Monroe SensaTracs, being gas-filled, actually add a bit of bounce to the suspension. (When you compress them, they automatically stretch back out to full length when you let go, unlike a shock which is just a damper.) This, to my way of thinking, gives the car (a 77B) a bit of a "rubbery" feel at the back on smooth roads. However, the damping is definitely better than with the regular lever arm shocks. At which point, a comment is needed. If you are replacing worn-out lever arm shocks, your perception of the difference the tube shocks make will be different than if you are - as I was - replacing a perfectly serviceable pair of lever arm shocks. I mention this only to put some perspective on the claims made occasionally for just how good the tube shocks are! The ride with the Monroe SensaTracs over ripply roads is better than with the lever arms. Road-holding seems about the same, although I have noticed a tendency to spin the inside tire on a tight turn more than before. Conclusion? The basic set-up is good and installation is quick and easy. I'm going to do another set-up on another car soon, and I'll try and find some non-gas shocks to see if they eliminate the odd feeling the Monroes give. If not, I will for sure try the very much less expensive Gabriels that Jim reported on! In any event, unless you want the adjustability of the Spax shocks or the originality of the lever arms, this conversion is a great way to keep the rear springs on your B under control. I made a couple of modifications to the installation that may be of interest. (3) pieces of 3/16" steel plate, 6" by 1-1/2", holes bored and reamed to match the original shock mount chassis holes. (2) 5-1/2" X 7/16" Grade 8 bolts. (2) 7/16" Grade 8 locking nuts. (1) 7/16" ID steel tube, cut to the same length as the shock mount tube. The two bolts are inserted through one plate, through the chassis from the fender side, and a second plate is slipped over the bolts on the inside. On the appropiate mounting bolt, one flat washer, upper shock mount, second flat washer. On the opposite bolt, the steel tube. Top it all off with the third plate and lock nuts, torqued to 40-45 lb/ft. Makes for a greatly stronger and more ridged shock mount, reducing the shear force substantially. Here is some shock data submitted by Rich Peterson. Its very important to calculate the maximum compressed and extended dimensions you require for your installation (see the notes in the parts list above), as well as to choose the correct mount types. I recommend a 7/16 inch mount and then reaming the lower mount to 1/2 inch as described above. The Monroe Sensi-Trac 5877ST used in Dave Tietz's original conversion has almost exactly the minimum dimensions according to Lawrie Alexander, so don't use something with a shorter extended length or longer compressed length or risk damage! The kit referred to below is the Moss front suspension shock conversion kit, the interesting information is the technical data. As suppliers and availability change, I'm sure this list will go out of date, and these specific shocks will get harder to find. Anyone out there should be able to research more alternatives on the Internet without much trouble, and I'd be interested in hearing about your results. Comments on "MGB Rear Shock Conversion"
Hi Everyone, I just started taking my newly aquired '70 MGB apart and found there was already a conversion to tube shocks. I'm trying to cross match the rear Gabriel shocks and can't find a number that matches. These thing are so shot. If I don't know amnything about the conversion type, it was done by a company called "We Race Inc" which had a sticker on it, will any of the above mentioned shocks fit? I'm a newbie at this car but I am enjoying working on it already! thank you dave tietz the shocks work great. now can anyone tell me how to do the front end without buying the kit? For some reason the Monroe Sensi-Trac 5877ST isn't stocked around here, although it is still in all the catalogs. It directly crosses to a Gabriel 69689 (which isn't in the table lower in the article of other shocks). Is part of their "G-force" product line. and I paid $24 retail for them. no name on them that I can see but do have what appears to be a part number - POC 04P 02H. rough. Any ideas would be appreciated. can somebody please tell me the correct ride height(empty) for a 1979 mgb. Thank you so much Dave. I loved the diagram, it was easy to follow and my sons were proud of me. I hope it is ok that I used lock washers on the back end there. 1.) my 77B has a saggy rear passenger side. Looks like about 2 inches difference from driver side. Is this likely the result of bad spring, bad lever shock, or both? 2.) I've read that when ordering a conversion kit, on 77 and later models with sway bars, this must be removed. I'd like to keep my sway bar in place, is that possible with the above conversion, or would the upgrade make the sway bar "non applicable"? I did this conversion years ago on my 80 B I used Monroe sensa matic shock I do get a little bouncy but it has helped braking as well as ride and cornering. It was well worth it and no modifications were needed to sway bar or anything else. Thanks Dave! Just did this conversion on my '68 - huge improvements to handling performance even though my lever action shocks were in excellent condition. Flipping the retaining plate was a stroke of genius. I found I only needed 4" bolts for my upper mounts though - maybe my rails are narrower than yours? Anyway, saved a lot of money not having to buy the conversion kit - not sure what advantage their manufacturers claim...anyone have any ideas? I guess I am too practical to be a total purist. I did keep lever shocks on the front, but the cost of levers compared to Monroe Sensa-track made it worth giving it a try when it came to the rear. Since I had to replace my sagging springs anyway, I did the flip/trade on the lower shock bracket and installed the tube shocks. That was 4 or 5 months ago and I have no regrets. I will keep the old levers in case the next owner is a total purist. Very nice! Good point re mount plate. What did you do up the front? Looks awesome. On the road yet? Been done for 10 years. Put about 1000 miles a year on it since.